Posted on March 13, 2018. Filed under Members News. Be the first to comment. As a leading international consulting and advisory firm focused exclusively on development banks, the Canada-based International Financial Consulting Ltd (IFCL) http://www.i-financialconsulting.com, successfully implemented an 8-month institutional development program for Uganda Development Bank, Ltd. 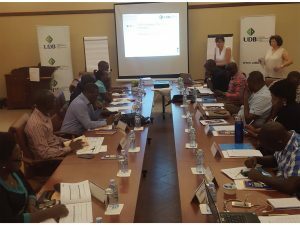 The objective of the project was to support UDBL in evolving from its existing state to a best practice development finance institution (DFI) with a board, management, and staff that are equipped to facilitate economic development aligned with Uganda’s national development plan. As a result, the project enhanced UBDL’s ability to deliver its development mandate more effectively and efficiently and assisted the Bank to enhance its economic and social impacts in the private and public sectors. The output of IFCL’s consultancy included a 5-year strategic plan and medium-term action plan; a new board charter; new credit appraisal processes and tools; credit procedures manual and credit policy; new environmental and social management system; HR policy and learning programs; M&E system, including development impact framework; new enterprise risk management policy, including risk appetite statement; and new liquidity policy. IFCL conducted an extensive training in all these areas to enhance the capacities of UDBL staff, management, and board members to fulfill the organizational mandate and to maximize development impact through support for economic growth. IFCL’s project , “Uganda Development Bank – Institutional Development Programme,” won the 2018 ADFIAP Outstanding Development Project Award under the human capital development category.